Rare US Money Values – How Much is Your Money Worth? US Money Values vary greatly upon a lot of factors. these include, but are not limited too, condition, availability, circulation counts, uncirculated condition, and demand from collectors, to name a few. What your 1880 silver dollar is actually worth will depend on more than just that year. It’s actually going to depend on whether the coin was circulated or uncirculated and where specifically it was made. A basic silver dollar, in this era known as a ‘Morgan silver dollar’ from 1880 is worth only about $21. But the rarer your specific version of the coin is the more money you could potentially be looking at, which is an important consideration for value. An uncirculated coin is going to be worth more money than one that has been circulated. That means something that is bright and shiny in appearance rather than the tarnished or dingy look a coin gets as it’s been used and passed around a bit. The four mints, San Francisco, New Orleans, Carson City and Philadelphia (which didn’t have a mark in this year) are important to look at as well and will greatly impact the value of the coin itself. Compare your coins to what’s listed and available below to find out what it may be worth. Never manufactured in Carson City, the 1886 silver dollar is another Morgan silver dollar that’s valued somewhat low if you’re just looking at a basic coin. For example, an 1886 silver dollar minted in Philadelphia (denoted by a lack of mintmark) in good condition is only valued at around $21. On the other hand, when you start looking at uncirculated versions of this coin there are a couple different ways that your coin could be worth a decent amount of money. Your best bet is to have a San Francisco minted coin or one that is uncirculated. An excellent quality San Francisco coin can get you nearly $100, while an uncirculated one could be worth upwards of $250. On the other hand, a New Orleans coin that’s uncirculated is definitely going to mean a good addition to your collection because it’s worth nearly $900 just on its own. If you have a circulated version of this coin, however, you’re not going to get as much value out of it. Though it’s still going to be something nice to add to the rest of your coin collection. If you have an uncirculated 1899 Morgan silver dollar you’re going to have a pretty good piece, since two of the different versions are worth $200 or more. The 1899 Philadelphia silver dollar is worth just about $200, while the San Francisco version is actually worth over $300. This doesn’t extend to the New Orleans version of the coin, however, which actually comes in at only about $35. You’ll want to check for those mint markings on your coin to find out just where it was made and what the value could be for yours. If you can get an uncirculated coin you’re going to be in the for the best, but if you don’t then a 1899 Philadelphia coin is the best of the three because it’s valued higher even if it’s not an uncirculated coin. Starting at $108 for a good quality version, you’re going to have a decent piece no matter what. The 1923 Peace silver dollar is one that a lot of people are looking for, though that only slightly translates to the actual value of the coin itself. The base value is less than $20 and the overall value itself isn’t quite as good as you might think for something everyone seems to want, but it’s still something to take a look at. This is one of those coins that doesn’t have any variance between different mintmarks or locations. A little higher priced as a base, especially compared to the other coins on this list, the 1928 Peace silver dollar starts at about $27. This goes up quite a bit, however, if you happen to have the Philadelphia version of the coin. This coin is definitely valued higher than the San Francisco version, but it’s going to be harder to find. What’s nice, however, is that you don’t have to have an uncirculated one in order to get a great value out of it. The Philadelphia coin is worth a good amount even in only good condition. Though the San Francisco one comes up to a good value when it’s uncirculated. No matter what coins you may have sitting around your home, you’ll find that each of these are a great addition. Of course, it’s important to note that there are plenty of other years that you can find silver dollars for. 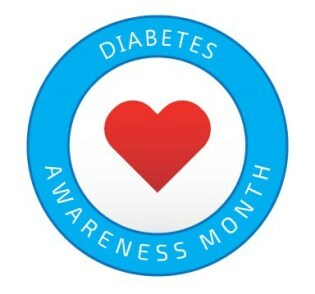 Maybe you have several in your collection or maybe you’re still looking to add more. Take some time to look at everything you have and then price out the other years as well. You may be surprised just how much value your collection actually has. When numerous people discuss the silver certificates they most likely think back to 1$ 1957-silver certificates. Nevertheless, the U.S commenced issuing silver certificates in 1878. A Silver certificate is termed as any old United States bill. As a matter of fact, only a few notes are real silver certificates. 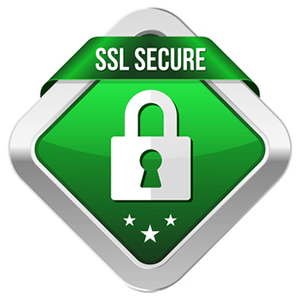 Read further to learn about these silver certificates. Silver certificates were published from the years 1878 to 1964 in the United States. These were issued to represent money as well as the part of the circulation for paper money. These certificates were redeemable for the face value in form of silver dollar coins, and after that, these were redeemable for one year, between June 1967 and June 1968, for raw silver bullion. 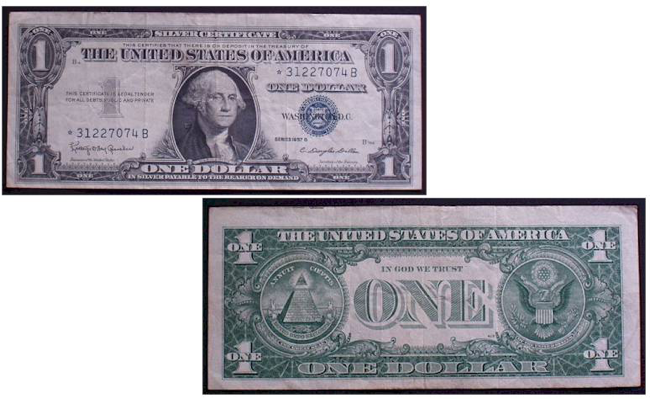 These notes have basically become obsolete since 1968, and are, therefore, redeemable in Federal Reserve Notes only, however, the certificates are still considered as a legal tender. 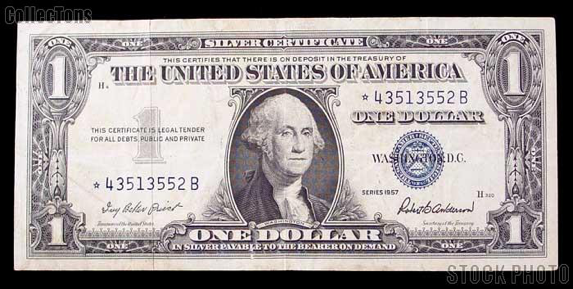 The real value of a silver certificate presently does not lies in its aptitude to be used as a legal tender, however for its value to collectors. The value of a note varies depending on the year it was issued in, as well as its condition. For instance, the extremely common silver certificates were those which were issued from 1935 to 1957. These look very identical to a regularly used dollar bill having George Washington on the front. These notes are normally worth a small premium over their face value, with circulated certificates normally selling for $1.25 to $1.50 each. Meanwhile, perfect silver certificates could worth from $2 to $4 per piece. Let’s begin with the most popular ones first. Any silver certificate from the year 1957 or year 1935 is very common. That comprises of any combination of letters such as 1957B or 1935F. Several block variations on all of the series of the year 1957 $1 silver certificates are available. Whether the serial number begins with any letter from A to Z, the value would still be similar. An exception for that is the note beginning, as well as ending with the letter B. BB notes are slightly scarcer, however, they still worth less than fifty dollars today. George Washington and a blue seal are printed on the front of these silver certificates. Their worth is about $1.50 in circulated conditions and around $5 in impeccable conditions. Only notes having serial numbers starting with stars worth $3 each. These silver certificates were printed by the millions and are still found in circulation nowadays. These can be purchased by the 100s at the shows as well as from the coin shops. Even the lowest rate worth, these have is only due to the curiosity element. Any 1934 or 1953 five dollar silver certificate with a blue seal printed on it is very famous. These worth $7 only in circulated condition. 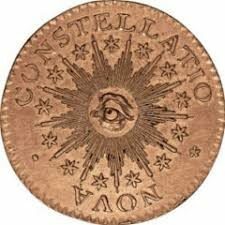 There are seldom star notes from these years. The 1953B star, as well as some of 1934 stars, are seldom. The star symbol would be placed at the start of the serial number. If a letter instigates and ends the serial number, that is a regular production of these notes. Silver certificates were printed in large numbers in the years 1891, 1896, as well as in 1899. For the greatest part, 1891 year notes look like to former issues. Nevertheless, 1896, as well as 1899 kinds are distinctive. The 1896 year series is eminently known as an educational series. The 1899 series of silver certificates offer chances to own a black eagle, a mini-porthole, or a chief. Big size silver certificates were produced in 1878 at first. Every note from the year 1878 or the year 1880 should be considered rare. The next sequence of the silver certificates had been issued in the year 1886. These are existing, yet we still don’t find them frequently. In the 20th-century large size silver certificates were issued in just two years, i.e. in 1908 and in 1923. The 1908 instance is a fairly hard ten dollar note. $1 and $5 bills were made for the year 1923. The one dollar bill is remarkably common and worth about fifteen dollars on average. The five-dollar bill from the year 1923 is fairly hard, and usually worth at the slightest a few 100s. The only greatest common large size note of US currency is the $1 silver certificate of the year 1923. These were printed in millions. At present, a nice looking specimen can be obtained for about $20. George Washington is displayed at the center of each of these bills. 99 percent of the time $1 silver certificates of the year 1935 are worth about $1.50. These were produced by the billions and they simply are not seldom or fascinating to the collectors. You can obtain packs of hundred consecutive 1935 notes for approximately $600. There are various types of 1935 $1 silver certificates. Starting from 1935A to 1935H and these were all published in addition to the regular 1935 $1 silver certificates. The $10 bill is the only supplementary small denomination produced as the silver certificates. 10s were printed for the year 1933, 1934, as well as for 1953. The 1933 instance is the rarest. The supplementary years normally sell for about $15 in circulated condition. Yet again, the star notes and the low serial numbers have a chance of being more valued. A low serial number on these silver certificate is termed as being under one hundred. One misunderstanding is people think that “IN GOD WE TRUST” should be printed on all of the 1935 silver certificates. However, it was not put on the currency until the year 1956. Therefore, only some 1935-G and all 1935-H $1 silver certificates comprises that. Many people have old silver dollars sitting around their homes and don’t really know anything about them. Maybe your mother saved them or your grandmother. Maybe you tracked them down and started saving them yourself. But do you actually know the value of those coins? 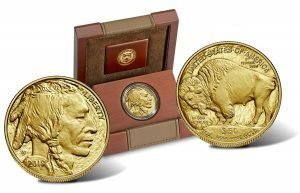 The truth is, different years of silver dollars are going to have different values, so take a few minutes to find out more about that collection you’ve had sitting in a drawer for who knows how long. Maybe you’ll want to hold onto them a little longer, maybe you’ll want to sell them off. It’s entirely up to you.